Socialist Solidarity - Good News – Gordon Campbell Quits! Good News – Gordon Campbell Quits! 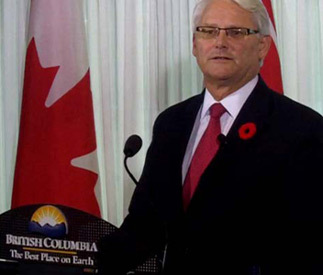 On November 3rd, Gordon Campbell abruptly announced his intention to resign as premier of British Columbia. His departure was true to form. For almost ten years, he controlled every action and statement from his ministers and officials, as he methodically eroded the welfare state. So when the master controller quit, it was as much a surprise to his own caucus as the public. The relentless frequency of corporate and wealth tax breaks, illegal contract stripping, reorganizations and creeping privatization of public healthcare, social services, housing and education, and restructuring of resource governance to eliminate regulations on forestry and mining practices, required careful stage management. Even the scandals, of Campbell's drunk driving conviction, the alleged rigging of the fire-sale of BC Rail and the RCMP raid on the legislature, were all stickhandled with great skill. The Olympics appeared to overshadow every rotten deal and lie the Liberals had perpetrated. Campbell's undoing was the introduction of the HST, to ‘harmonize’ provincial sales taxes with the federal GST for a new 12% tax on virtually every good and service bought. Not only did his government flip-flop when the new tax was introduced, after a third consecutive election victory in which they promised not to bring in a new sales tax, but Campbell claimed that the new tax was a response to post-election revenue concerns. However, access to information requests reveal that financial officials were discussing with federal counterparts how to implement the HST before and during the "no new sales tax" election. Campbell's popularity over the last ten years was staggering, which needs some explaining, but his fall from popularity was equally noteworthy. The HST flip flop was met with a province-wide anti-HST petition signed in 90 days by 557,383 registered voters, exceeding the 10 percent threshold to force a referendum on the legislation. Campbell dealt with the successful anti-HST initiative petition by scheduling a province-wide referendum on the tax for the autumn of 2011 rather than, as the campaigners had demanded, a legislative vote in the upcoming session in Victoria. This outcome was coupled with the shocking end of the five-year BC Rail court trial. Just as Campbell's ministers were about to be called as witnesses, two former leading Liberal aides who had been fighting corruption charges suddenly pleaded guilty, and then had their four million dollar legal bill paid for by the provincial government. Attorney General Mike de Jong claimed that a special independent prosecutor, and not the government, had exercised due authority to make such a deal. But BC law requires that such a payment can only be made with ministerial approval. A poll in mid-October rated Campbell at a record low of 9 percent popularity. But instead of resigning then, Campbell shuffled his cabinet ministers and rearranged the resource and environmental ministries into a large one-stop-exploit portfolio. Then he bought $240,000 worth of TV time to announce three things. First, Campbell stated that he was very, very sorry that he had explained the HST so poorly, but attempted to explain it one more time as a beneficial combination of rebates and exemptions. Second, he announced a 15-percent income tax cut on the first $72 000 of income, putting literally hundreds more dollars in the hands of citizens (and blowing the $1.6-billion federal transition money to meet the deficit driving the introduction of the HST). Third, he promised to make sure every grade 4 student in BC would pass the standardized tests for literacy and numeracy in four years, when over 80 percent were passing already. No one in BC regarded this announcement as believable, not even his lieutenants. His personal popularity fell to 6%! Back in 2001 Campbell and the Liberals took 77 of 79 seats. It was a blowout of a staggering social democratic government in a permanent leadership crisis, forcing out Mike Harcourt for the arrogance of Glen Clark, and for the sorry admission of Ujjal Dosanjh that the NDP couldn't be trusted. No wonder Dosanjh ended up in the federal Liberal party. The next four years saw utter brutality against every aspect of the welfare state. But the labour movement's response was to retreat and accept the Thatcherite mantra “TINA”--There-Is-No-Alternative to the market. In spite of this retreat, the victims of illegal contract stripping fought back. BC public school teachers launched a two week illegal strike that stopped concessions and, prior to that, there was an effort by hospital support workers to build a general strike. Mini-rallies in small cities drew immense support and trained union members how to recruit community activists and supporters. When the HEU strikes began, CUPE members responded and so did many other unions like the Trail smelter workers. It took three days of round-the-clock talks between senior ministers and BC Federation of Labour leaders to end the near general strike, but with only a few negotiated closures and paltry severance cheques to show for their work. A court victory later that declared these contract-stripping bills unconstitutional was cold comfort after the cuts. Instead the labour bureaucracy directed workers' anger into new NDP leader Carole James' campaign in 2005. In spite of the crimes of Gordon Campbell, and the loss of thirty seats, the Liberals retained a majority government. Again in 2009, after controversies over gambling, homelessness, disability, the arts and Olympic spending overruns, the NDP took a few more Liberal seats, but failed to defeat Campbell. TINA has taken its toll. But we can find inspiration in workers' action. The strikes were a glimpse of the real wishes of the people for clean operating rooms and teachers with reasonable classroom sizes. And a few unions saw beyond their contract management roles to create an opening for workers’ self activity. In provincial politics, however, the NDP has moved further to the right, trying to court business leaders and stake out law and order positions, dissolving the union membership component of the party, and playing PR games with Liberal gaffes. Gordon Campbell is gone. He tried just one too many times to fool the working people of British Columbia that tax cuts for the wealthy, fewer public goods and services, and more taxes for workers was a good thing. And now the corporate forces that support neo-liberal politics need a new face to promote the old TINA argument. But for the working majority there is a different question. Can we provide a new strategy that builds on the sparks of class struggle to defeat that continued message?